Restaurant deSanchez is called the snootiest restaurant in San Juan by one major guide book on Argentina and not even mentioned in the others, so I had to see for myself. 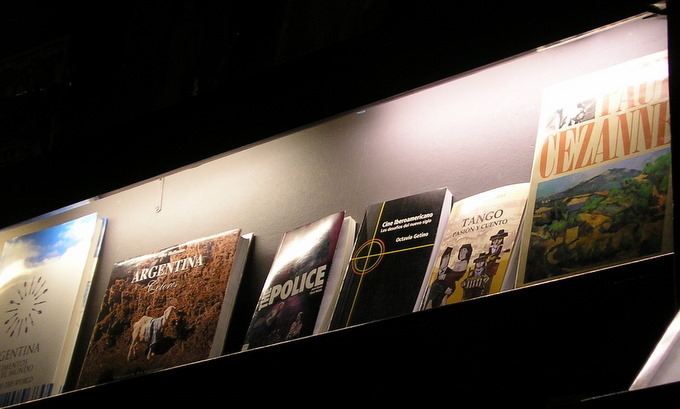 I walked past Rivadavia 61 a couple of times before I realized that what I thought was a pretty classy looking book and record store was actually Restaurant de Sanchez. I entered a room with a 20 foot high ceiling and walls covered in real silk. 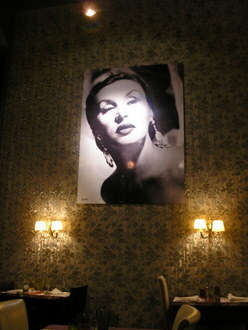 Several huge black and white photos of classic Hollywood starlets hung on the walls. 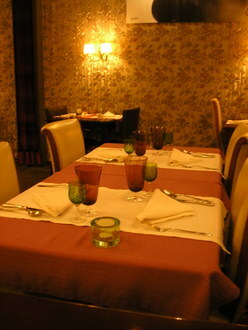 The tables, only about 15 with soft leather chairs, were set with linen, china, silver and green and lavender crystal. 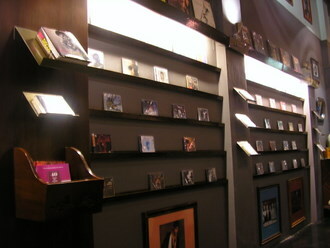 The other wall was lined with books and CDs both for sale and perusing during dinner. The book collection was eclectic and not always new: Mailer’s El Gran Vacio (The Big Empty), Diccionario de la Música Argentina, Jean Max Mejean’s bio of Pedro Almodovar, a Sonny Rollins CD. Above the book case were classic rock album covers mounted on the wall - Abby Road, Rolling Stones. At the end of the case was a beautiful 1940’s wooden console record player. Rock music was softly playing and during the course of the next several hours, morphed into jazz, Latin vocals, and classic tango. I was greeted with smiles and warmth even though I would be occupying a table by myself on a busy Saturday night. “Snooty”? I wonder if the travel writers for major guide books actually eat in the restaurants they review? Their recommendations on Argentina's restaurants have more often than not been dead wrong. I understand a menu in Spanish and was surprised when a bowl of aromatic Sopa Crema de Calabaza y Verdures (Cream of Pumpkin and Vegetable soup) was presented. 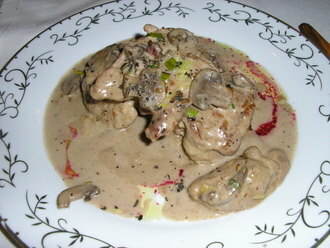 I did not remember “sopa” in the title and thought I had ordered Mollejas (sweetbreads). Although the soup was warm instead of hot, it had a deep rich flavor. To my surprise, I had not misread the menu. The soup was an amuse bouche - usually a tiny little starter that the chef’s prepared, not an entire bowl of soup. My Mollejas arrived with at least six piled high in a rich cream reduction with mushrooms, scallions, rosemary, pepper with a touch of pomegranate for color. The portion was large enough to be an entrée. The sauce and seasonings were excellent. The sweetbreads had been just a touch overcooked which resulted in a bit of chewy texture. I was pleased to have some nice, warm rolls for the sauce. The main course was baked Congrejo (conger eel) in a lemony fish broth with a colorful mix of sun dried tomatoes and roasted zucchini, calabaza and peppers. Again, the Chef knows how to prepare fine sauces. The Conger eel was properly baked. It’s a meaty fish, like shark, and was well served by the sauce. I decided to try a dessert. My server made a recommendation which I accepted. The wait was considerable, but if I had been with other people conversation would have taken the time - the Argentines do not rush a meal. It was an ambitious creation. A wedge of almond ice cream had been breaded in almonds and cake crumbs and lightly fried. It sat on top of a wedge of cake. 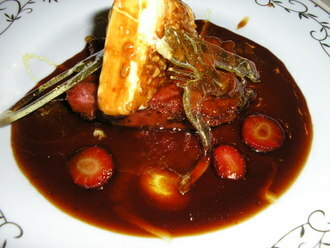 A very sweet cherry sauce with strawberries surrounded the two and amber pulled sugar decorated the top. Argentines love sweets, and I imagine they like this creation. Personally I would never make this combination for I found it much too sweet for my taste and the portion large enough for at least two people. The breaded almond ice cream alone would have satisfied me. I did want to try a glass of wine from San Juan Province. I had a glass of 2008 Torrontes white “Valbona” from Bodega Augusto Pulenta It was fruity but dry - a nice combination. A full bottle would only have cost AR$30 (US$8.50). Even though the dinner was not perfect, I would return to de Sanchez. The imaginative atmosphere, solicitous staff, decidedly not snooty service, and creative dishes made for an enjoyable evening. My large meal cost AR$115 (US$31.00) It is only open for dinner and reservations are recommended. Café Capalino, at the mall on Avenida Tucuman, is one of many pleasant cafes with outdoor seating. At the end of the second month of Argentyina's Autumn, it was in the mid 70 degrees at 5:00 pm on a Friday afternoon, and the mall area was quickly filling with families and young singles for the usual Friday shopping night. But this was also the start of a three day weekend since Monday would be the 25th de Mayo, Argentina’s independence day. The tree canopy was alive with hundreds - possibly thousands - of very loud birds. Over the next few days I noticed that this is where they slept and carried on raucous conversations until late at night. It was a great location for people watching. I ordered another in a long series of Argentine ham and cheese sandwich variations. This was a double decker, on large square crustless slices of bread (big enough to serve two people). The bottom layer had ham and cheese and the upper layer had lettuce, tomato, chopped hard boiled egg and anchovies. 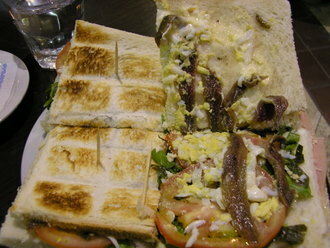 I know what you’re thinking, but I love anchovies on anything, and so do many Argentines. This huge sandwich and an espresso, set me back AR$22 (US$6.00). Restaurant Baro is not only next door to de Sanchez, they share the same owners, kitchen and even the wall separating them is open at the back service area. But the decor and menu are totally different. Baro is currently San Juan's hip place to have breakfast, lunch, afternoon coffee and dinner, until quite late. It’s brightly lit and colorful but with an informal inviting manner, and it has outdoor seating. It specializes in pastas and pizzas - Argentine’s favorite comfort foods. The pastas are all homemade as well as the pizza crust. I went to dinner on a Sunday - few Argentine restaurants of quality are open on a Sunday evening - with two friends getting the chance to sample three pastas and two salads. Mark ordered Raviolis de Ricotta con Roquefort (ravioli stuffed with ricotta with a blue cheese sauce.) It was a satisfying and rich combination. I had Sorrentinos de Trucha Ahumada y Ricota con salsa Champignones (large round ravioli filled with smoked trout with a wild mushroom sauce). The combination of the intense smoky trout and the earthy mushrooms was unlike any pasta dish I have ever tasted. It was the perfect synthesis of Italy meets two of western Patagonia’s classic ingredients. It definitely is a dish I will replicate. We shared two salads. One was a mix of greens, smoked pancetta, and cheese with a creamy vinaigrette, (unusual for Argentina which usually serves oil and vinegar only) the second was slices of tomato topped with a warm mixture of melted mozzarella, chicken and mushrooms. Both were interesting dishes in their own right and not mere compliments to pasta. We all shared a bottle of a San Juan vintage, Ampakama Syrah Tannat 2007, a nice smooth, dry red wine. The total for all three dinners plus the wine was AR$119 (US$32.50). There are several smaller hotels on the Plazas that seem pleasant, but I choose Hostel Triasco, Pedro Echagüe 520, is a perfectly acceptable hostel for sleeping. The rooms are well kept and each have baths, even the 4 and 6 bed dorms. My private room was only AR$92 (US$25) per night. The hostel is owned by the travel agency of the same name, not an uncommon arrangement in Argentina, and they can book excursions especially to the Valley of the Moon where they have another hostel nearby. 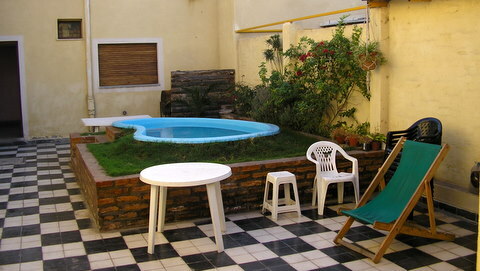 I did unfortunately, find a few aspects annoying which did not occur at other Argentine hostels. (1) Their WI-FI connection, which was one of their advertising points, did not function. The problem was with their modem, not the system, but during the three days I spent there no one made any effort to fix the issue (buy a new modem). Only one ancient computer existed that had a very slow connection and needed a new keyboard since you had to press very hard on the sticking keys. (2) I wish Argentine hostels would not serve breakfast. It makes the kitchen unusable for guests that would like to eat a more nutritious meal other than bread and coffee before embarking on a hike or even more arduous trek. The breakfast that was served was bad by any standards: tiny pieces of toast, cheap, sugary spreads and very bad coffee. (3) Their common room/dining room was dreary and unwelcoming - odd for an Argentine hostel - even though they advertise the space as a public bar and café. They did have the wonderful milongo that I walked into the first night, but it was the people present that made it memorable. I would never have been attracted to the physical space if I wasn’t already there.